This week fellow author Christine d’Abo mentioned The Writer’s Guide to Character Traits by Linda N. Edelstein. It contains all sorts of neat information and inspired by Christine’s post, I dragged it out of my bookcase. 1. Creates in order to heal old wounds in themselves. 4. Often drink alcohol, especially after forty. 5. Depression in younger writers. 6. Problems with anxiety and drug use. 7. Has to tolerate aloneness. 8. Has to let go of work. 9. Families with mental illness and creativity. As a writer I plain disagree with some of these, although it’s good to know I don’t need to feel guilty about drinking wine anymore. I think writers are articulate, imaginative, driven, fear rejection, respond well to chocolate, have great imaginations, are determined, hardworking, good procrastinators (at times) and can suffer from bottom spread. I’m sure I’ve missed quite a few. What qualities do you think writers have? Playing to Win, the very first book I wrote is a romantic suspense. I’ve written many different genres since then, but one thing remains true. I love to add a suspense element and if I can sprinkle the odd body or two between the pages, so much the better. 1. A villain doesn’t have to be really evil and horrid. The villain in a romance might be an old girlfriend, a brother or sister, a mother-in-law or the man living next-door. They can be a meddling friend who is trying to match make. You don’t need a high body count to make a villain. Villainy comes in many forms such as the ex-girlfriend intent on regaining the hero’s interest. 2. When you’re thinking about your villain, give him good points as well as bad ones. Make him three dimensional. If he’s a well-rounded character then he’s actually scarier because we, the reader, come to like him or we might see part of our own character in his makeup and empathize. 3. Think about having your villain mirror your hero or heroine actions. Give them a similar conflict but have them behave in a different way to solve the conflict. 4. Give your villains a good reason for behaving in the manner they are—in other words, good motivation for their actions. 5. Make use of the setting to enhance the villain i.e. cold or stormy weather or late at night. Every bit counts! 6. Take as much care when choosing your villain’s name as you do when picking a name for your hero and heroine. A good name can help make a villain. How do you like your villains? Subtle or in-your-face? Who is your favorite villain in fiction? Are there any characteristics you like to see in a villain? 1. Potatoes were first “domesticated” or cultivated in the Andes thousands of years ago. They had hundreds of varieties including a frost-resistant one. 2. The potato derived its name from the American Indian word “Batata”. It was introduced to Europeans by Spanish conquerors in the late 16th Century. 3. Potatoes were not initially accepted in Europe. Some people thought they caused disease. 4. In 1845 and 1846 the potato crop in Ireland was devastated by fungus. The potato had become a major food to the Irish causing the “Irish Potato Famine” which caused many Irish to immigrate. The population of Ireland decreased by nearly two million between 1847 and 1851. 5. The potato is the second most popular food in America, beaten only by milk products. 6. The average American eats over 120 pounds of potato a year. 7. One Medium Potato (150 grams or about 1/3 pound) contains 110 Calories, 3 grams of protein, 23 grams of carbohydrate, 0 grams of fat, 2710 mg of fibre, 10 mg of sodium and 750 mg of potassium. 8. A potato contains 80% water. 9. Potatoes are related to the tobacco and tomato families. 10. Antoine-Auguste Parmentier was a 18th century agronomist who convinced the common French people to accept the potato as a safe food. (They thought it caused leprosy.) 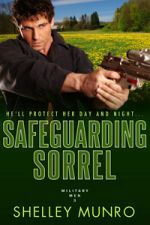 He used reverse psychology by posting guards around potato fields during the day to prevent people from stealing them. He left them unguarded at night. So, every night, the thieves would sneak into the fields to steal potatoes. 11. Mr. Potato Head was born in 1952 and was also the first toy to be advertised on television. 12. Instant mashed potatoes (dehydrated potatoes) were introduced commercially in 1955. 13. Marie Antoinette wife of Louis XV was known to wear potato blossoms as a hair decoration. And a final one – my favorite way to eat a potato is baked in its jacket, served with Greek yogurt and ground black pepper. Hey, I’m on a cutback so I will fit my clothes for Nationals, otherwise I might have said sour cream and butter!! What is your favorite way to eat potatoes? When we first moved to our current house the section was bare, and the soil consisted mostly of clay. After throwing around some ideas we decided to design a potager garden. 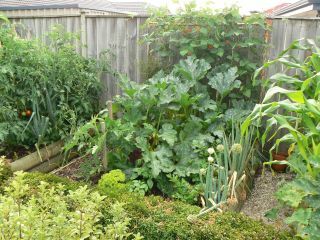 A potager is French and it’s a raised bed garden, normally for vegetables and herbs. Hubby built three box squares out of timber and filled them with good quality soil. We made a decorative path between them so it’s easy to plant, water and harvest and not long ago, Mr. Munro planted a hedge of shelter trees because it seems to be windy where we live. 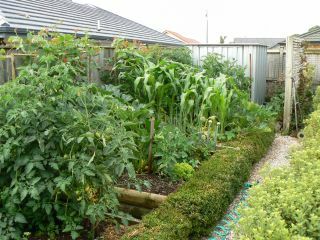 Mr. Munro spends hours out in the garden and periodically, I have to go out an inspect his latest improvements and crops. This year we’ve had fresh potatoes, lettuce, zucchini, red onions, leeks, green beans, basil, radishes, beetroot and the tomatoes are starting to ripen. It’s so handy just wandering out to the garden to pick whatever vegetables we’ve decided to have for dinner. I have to confess I’m a bit tired of zucchini but I’m really enjoying the green beans and can’t wait for the tomatoes to ripen so I can make fresh tomato sauce to have with pasta. 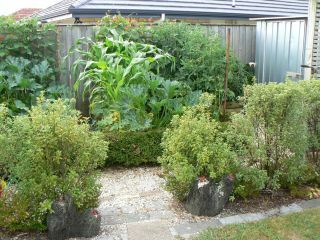 Do you grow your own vegetables? What do you grow? And if you don’t have a garden, what is your favorite vegetable to eat?